Top Used Quads - Sport Model Buyer's Guide to Best Buys. 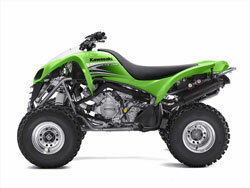 Buying used quads can be tricky - especially sport quads. But you can improve your odds of finding a good one if you do a little research first. So we decided it would be good thing if we did the research for you, since we have access to a little more info than the average ATV rider. Don't get the wrong impression - we'd much rather be riding than doing research. But, well ... it had to be done. And we think it was worth it because we uncovered some potentially great used quads! The results were based on thousands of owner surveys, so we're confident that our list of Best Buy used quads is accurate. And that's why we are glad to recommend them to you. 400 DVX - One of the mechanical triplets here. The DVX shares running gear with the Suzuki Z400 and the Kawasaki KFX 400. It feels a little different due to a harder seat and Arctic Cat's own plastic bodywork. The Arctic Cat 400 will do everything the Suzuki will - which means it's a great ATV for trail riding and just all around playing. Since the Cats normally don't bring as much on the used market - you may be able to find a deal on a used DVX. Which would make it a best buy as a used ATV for sale. Sportrax 250EX - User friendly best describes one of the best beginner's sport used quads available. The 2006 and up models came with the Honda Sport Clutch to prevent stalling that made things even easier. Simple and tough air cooled engine and shaft drive keep maintenance to a minimum. New riders can spend more time on the Sportrax than they have to spend spinning wrenches to keep it running. Honda must be doing something right because the 250EX had excellent owner survey ratings for every category. As used four wheelers for sale go, this one has to be one of the best values you can get. Sportrax 300EX - This one is a great choice for larger beginners, yet still fits most full size adults just fine. Experienced riders will be surprised how good the TRX 300 is on tight trails. Tried and true Honda air cooled engine backed up by high quality running gear make for a tough, simple, and reliable package. Easy to use torquey power with good brakes and agile handling keep the fun meter pegged. It excels at tight trails and play riding. May run out of breath on big dunes or wide open high speed runs. It still had a very high owner satisfaction rating with excellent reliability. Truth is, this is all the sport quad many riders would ever need. Sportrax 400EX - Seems like the TRX 400 has been around forever. Which makes it one of the easiest to find used quads on the market. It's always been a solid ride, but since reverse gear was added in 2005, we like it even better. By far the most popular sport quad Honda has ever built. Since the 400 is a hoot to ride we think that might have a lot to do with it. Plenty of usable power and more than decent suspension and brakes are a very user friendly combination. 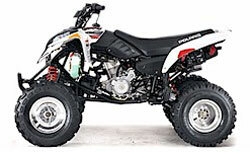 One of the highest owner satisfaction ratings of any Honda ATV and a bullet proof reliability record make this a top choice on the list of sporty used quads. 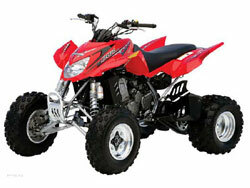 Sportrax 450R - The high performance and racing sport quad in the Honda line up. These are serious used quads and probably not a good choice for the inexperienced rider. More maintenance is required than the for the milder models. Buying used quads that have been raced can be an iffy proposition. It's best to know some history about the ATV and its' rider. Racing stresses machinery to the max - but racing ATVs are usually well maintained. Find a good one with some performance accessories and maybe some spares - and save big bucks on the package deal! The 450Rs were very reliable, so they would be good bets as used quads. Just do a little homework to make sure you're getting a good one. KFX 400 - Comes off the same assembly line as the Suzuki Z400. You can consider them interchangeable with only major difference being the bodywork. The KFXs are great used quads for all around sport riding. There's a good reason three manufacturers all share this model. It just happens to be one of the best all around sport ATVs ever made! It may not be the fastest, but it is at home on almost any type of terrain from race track to trail to dune. Between Arctic Cat, Kawasaki, and Suzuki, there were tons of these sold. It should be easy to find a good one - just pick your favorite color - red, yellow, or green. Accessories are also plentiful so you con mod it just like you want. KFX 700 - The heavyweight of sport quads in more ways than one! This thing is a tank of a sport ATV with a V-twin engine, CVT transmission, and shaft drive. Those specs really put it closer to the sport/utility class except for the 2 wheel drive. Wide open spaces are the 700's specialty and it is good at that! Trail riding not so much. It'll do it but it takes a lot more work than other, lighter, sport quads. These are more complicated than other sport type used quads so be sure to look for one that has been well maintained. Since much of the running gear was sourced from utility models it should be under stressed on the lighter KFX. Predator 500 - The Predator scored well in the owner ratings with almost everyone complimenting the power. A few did report some reliability problems when new, so make sure those have been corrected on any used model you're considering. Exhaust, air filter, and carb jet modifications improve the power even more according to several owners. Handling may be a little lacking on trails but seemed to satisfy most riders overall. This isn't a ride-it-and-forget-it ATV. It won't respond well to abuse or lack of maintenance. But respect the power and pay attention to the upkeep, and this is a sport ATV that will be a thrill every time you hop on. Outlaw 500 - The first sport quad with an independent rear suspension. It's not for everybody, but most owners seemed to love it. It can't be beat for rough trail riding. If you want to tackle rougher terrain than a normal sport ATV can handle - but don't want the weight of a 4x4 utility - this is your ride! Power is a little soft at the bottom end, but makes up for it with a good surge at mid range and top end. Polaris has a reputation for inconsistent quality and the Outlaw is no exception. Most owners reported good reliability. But several did have problems with rear sway bar mounts and steering linkage. Make sure these have been fixed on any used model you buy. 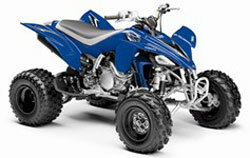 QuadSport Z250 - Intended as an entry level sport ATV, the Z250 is designed to be as user friendly as possible. Maintenance is kept to a minimum with automatic clutch, manual transmission, shaft drive, and air cooled engine. Most of the running gear is from the Ozark utility model so it's plenty tough in the much lighter Z250. The engine is tuned for more performance and a few other tweaks help provide a sportier riding experience. The Suzuki 250 is a great choice for someone wanting a sport ATV that's easy to ride and maintain - and tough enough to tolerate the mistakes new riders will make. QuadSport Z400 - Even though the mechanicals are shared with Arctic Cat and Kawasaki, you'll see more Z400s for sale as used quads. The Suzuki is considered the standard for this model. These sport quads are edgier than the Honda 400 without being as extreme as the highly tuned 450s. They have broader power bands but with enough zip for almost anyone. The Suzuki seems to be the most comfortable of the three and would be our pick if you had to choose. Overall handling and rideability are first rate. Considering the great owner survey ratings, these ATVs need to be at the top of anyone's list for a mid size used sport quad. 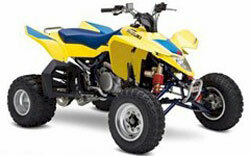 QuadRacer R450 - When the R450 came out in 2006 - it obsoleted all other racing quads. It was a race winner right out of the box. The fact that thousands of dollars of modifications weren't necessary gave it a reputation as a great value. It may be a little wide and low for tight and knarly trails, but those would be the only shortcomings. Find a good one and you'll be treated to great power and handling at a budget price! The R450 will take more upkeep (as will any of the 450s) but most owners reported good reliability on this one if it wasn't abused. There are a bunch of these around so keep looking until you find one in great shape. Raptor 660R - The big Raptor may be the best speed per dollar deal of all used quads! Light, agile, and with more power than you need everywhere. Yamaha took a page out of American hot rodding and stuffed the biggest motor they could in a light weight and smallish sport quad. If you're a beginner - mark this one off your list right now! The 660R generates enough speed you can be in trouble before you even see it coming. But for the experienced rider this is close to the ultimate sport quad. Since the 700R came out, used 660s can be had for some bargain prices. And it's still an awful lot of sport ATV for the money. Reliability was good but if you abuse the power things will break. 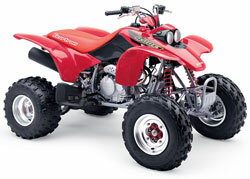 Warrior - Forerunner to the Raptor, the Warrior was the best selling sport quad of all time. As used quads, they're still high on the popularity list. This is another sport ATV that is great for beginners but will still satisfy most experienced riders too. You'll get a solid 350cc engine with good power, along with handling and brakes that work well in almost any riding situation. It's not as good at high speed riding as the more serious sport quads - but for trail and play riding it's hard to beat. Electric starting and a reverse that can be engaged regardless of which forward gear you're in keeps it user friendly. Grease fittings are provided on all critical pivot points to keep maintenance fairly painless. Raptor 350 - The mid size Raptor is a good choice for both the new and experience rider that's more interested in play riding than anything serious. It has a plush seat and suspension that smooths out most trails without working too hard. A broad range of power hits hard enough to keep most folks entertained. It's very similar to the Honda 300 - user friendly and deceptively fast on tighter trails. The Raptor has a better ride while the Honda has slightly sharper handling. YFZ 450 - Yamaha's first really race oriented sport quad. It was the horse power leader when it came out. Suspension and brakes are very good stock so you don't need to worry about them. 5 speed transmission limits the top speed for play riders, but it accelerates hard enough you probably won't notice. Popular mods are exhaust pipes, air filters, and jet kits. Power is improved through the whole range, but it really helps the bottom end. If you like to ride tighter trails or just like the feel of a strong bottom end hit - that's something to keep in mind. Owner survey ratings were very high and the YFZ had good reliability for an ATV intended for racing. There were some complaints about a stiff throttle and a hard seat. Raptor 700R - Wider, lower, more powerful version of the 660R. Fuel injected engine is even smoother and more responsive then the original. You also get upgraded suspension and brakes so this is really a premium package. These just came in out in 2007, so as used quads for sale they may still be a little pricey. You just need to find an owner that has scared himself silly and convince him that in the interest of self preservation - he should sell his 700R to you!